NOVEMBER 30, 2011 – I have no idea what “being fulfilled as a nurse” means. I hear fulfillment stories from my grade-conscious classmates in College and/or corny staff nurses; it’s just depressing that I do not have the slightest hint on how it feels. I know how to be fulfilled as a performer – when the audience applause; I also know what it feels like to be fulfilled as a daughter – when my parents thank me for being me. But as a nurse? I think I’d need more than my seven months of experience to finally know the feeling. And just as I am in this era when I fancy resigning, God had made possible the unthinkable: Nurse Peng felt fulfilled. It happened the day our longest-staying patient went home recovered. Mother, as I fondly call her stayed 2 ½ months in our care. She was one strong woman and I’ve seen her gone through a lot of difficulties that is way beyond your average fever. I admit that there were times when I doubted her recovery, but she has always proved me wrong. Mother’s family comprises of several nurses. Believe it or not, the toughest patients to have are those who in one way or another are related to a nurse: may it be his/her sibling, parent, grandparent, or the patient is a nurse himself. 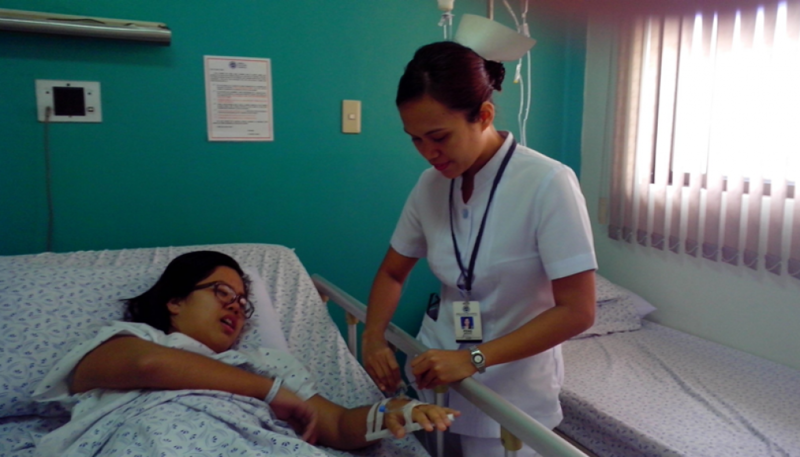 From my experience, nurses as relatives and/or patients tend to be bossy, questioning and bloody irritating. They question your nursing practice as if they do not know that hospitals have unique standards in almost everything. But Mother’s family was nothing like that: they were helpful and trusting. It’s embarrassing that they sometimes know better but I’m glad to be taught as I know that we have the same goal in mind: to save a life. On Mother’s discharge day, I was in total awe seeing her being lifted from the bed she has long lied on and transferred to a wheelchair. At that moment, I thought: “If miracles are real, then this must be it”. It’s a miracle how seven attending doctors, six nursing aides, 18 staff nurses, and an innumerable number of resident doctors have worked hand-in-hand for the sake of one patient. It’s a miracle how that once unresponsive patient now waved goodbye with a smile plastered on her face. I know I shouldn’t be attached to patients; but this one really made an impact on me. I sometimes miss Mother’s presence in the ward although I would never want her to come back. It’s good to think that she’s home safe and comfortable. I guess the feeling of being extremely happy for complete strangers’ recovery is the best definition of the so-called fulfillment. I’m quite sure I would never have felt this if I was elsewhere. Why You Should Get the Marian Choir of Cavite as Your Wedding Singer	Merry Duty!